It’s been a busy week. Sunday I drove my parents back to Delaware. I made a mistake on the last blog entry. Its six hours to Delaware not four. I dropped my parents off on Sunday and my sister came back with me on Monday. We have had a great time relaxing on the porch swing and doing some girly shopping together. Today most of our dinner was made with ingredients grown right here on Pot Hole Farm. Someday we hope to never go to the grocery store again or very seldom which would make me totally happy since I hate to grocery shop. I would much rather pick up my groceries straight from the garden or the root cellar. PHF's bounty. 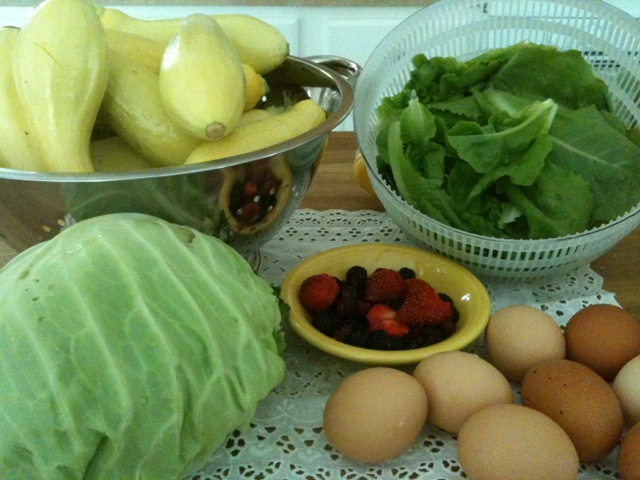 Cabbage, squash, lettuce, strawberries. wild raspberries and eggs. This year the wild black raspberries are growing in abundance. My sister and I found numerous bushes of them right here on our property. Unfortunately some of them are difficult to get to, but we will find a way. The garden is doing well although something has eaten the heck out of our cabbage plants. We were able to save a few so not all was lost. Everything else seems to be on the road for a successful harvest. My parents have been visiting PHF this week. Sonny and I have sure enjoyed their company and although they only live about four hours away it is difficult to visit as often as we would like. My father is 88 years old and my mother is 82, but you would never know it. Sometimes I can’t even keep up with them. Dad has been helping in the garden and we value his advice and of course Mom has helped in the kitchen. Yesterday my dad washed the Dirt Mobile, saying that he would be embarrassed to ride in it down the highway. Can’t say I blame him. It was covered in dust and mud. I don’t want to share my West Virginia dirt with Delaware anyway. I’m not sure the flat landers would know what to do with it. We do a lot of laughing around here and believe me there is usually something to tickle your funny bone. The best one this week was when my dad got ready to get into bed the first night of his visit. Sonny had cut the wood slats a little short and part of it was my fault, because when I put the bed together I didn’t have it set quite right, so the measurements were wrong. When my dad started to get into the bed the slats bowed a little and the mattress along with my dad and his dog Heidi were on the floor. His expression of surprise was worth a million dollars. Even the dog looked shocked with her big brown saucer eyes. We fixed the problem and Dad has had restful sleep ever since. I’ll soon be driving them back home and picking up my sister for her visit. I will bring them back in the fall to enjoy the colorful foliage. I wish I could see my family more often, but farm life does not allow for much travel especially this time of year. 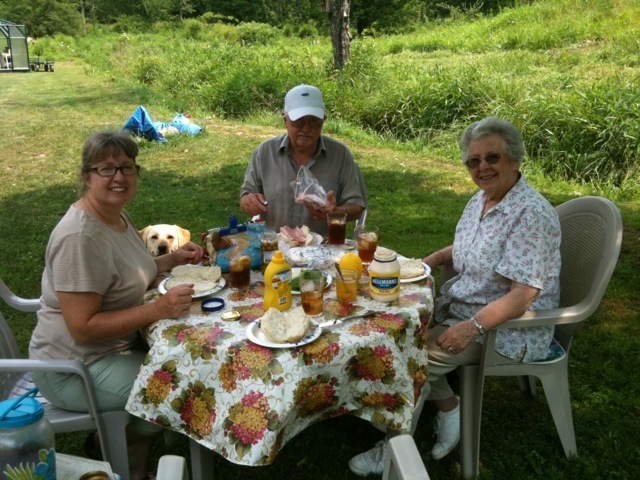 Enjoying lunch under the shade tree. The little guinea chicks are six days old now and growing like weeds. There is a constant chorus of chirps coming from the box, the only exception being when they are stretched out in guinea slumber. They are developing quickly and should be with the amount of feed they consume. If its not the sound of chirping its the sound of little yellow beaks pecking the sides and bottom of the box. Tiny black eyes are becoming keen in preparation to see bugs crawling on the side of the house or hanging on a leaf. They are making up their own games, teaching themselves how to be swift of foot and quick of beak. Today I checked in on them and discovered that a guinea football game had broken out. One of the chicks had figured out how to tear off a piece of the newspaper that lines the box. He was racing around the small enclosure zigging and zagging, the strip of paper hanging out of his beak like a wiggly worm. The other six chicks chased behind him, their beaks frantically snapping for the waving paper. I’m not sure who won the match, but when I checked on them a few minutes ago they were all asleep in a feathery pile. It was hard to tell where one guinea started and another one ended. Maybe they finally tackled the chick with the paper strip and collapsed from exhaustion where they fell. The box is quiet now. No pecking, scraping or chirping. I give it about a half an hour for the second quarter to start. For a few weeks now we have had a furry freeloader with sea green eyes peeking at us through the weeds. A bowl full of kitty kibble can coax him out and after working with him, he now allows us to pet him. He wants so much to become a part of PHF, but is still a little leery of fast movements. Especially of Ruby who likes to chase him away. I have named him Sampson because he has long silky fur and a handsome face. I have no clue where he came from, but he looks healthy and makes me think he once belonged to a family. He may have come from one of the farms down the way or maybe someone dropped him off. Either way he has decided this is his home. 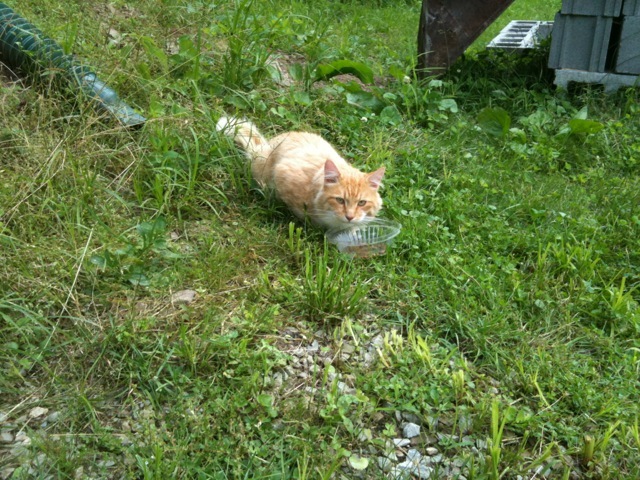 For now he tends to hide out in the grass, but I hear him meow at me whenever I come outside. He doesn’t get along very well with Moby and I have to say it isn’t Moby’s fault. Moby steers clear of his presence. Maybe in time they will become friends. I believe Sampson is a friendly cat that is frightened of his situation. He looks like he was well taken care of at one time and is used to other animals and people. He has never bothered the guineas or chickens and didn’t even growl at Roo Roo when he stuck his beak into his face while he was eating. I think Roo Roo thought Sampson should share his dinner. It will take a while to build his trust in us and realize that Ruby is just a big softy who wants to play. 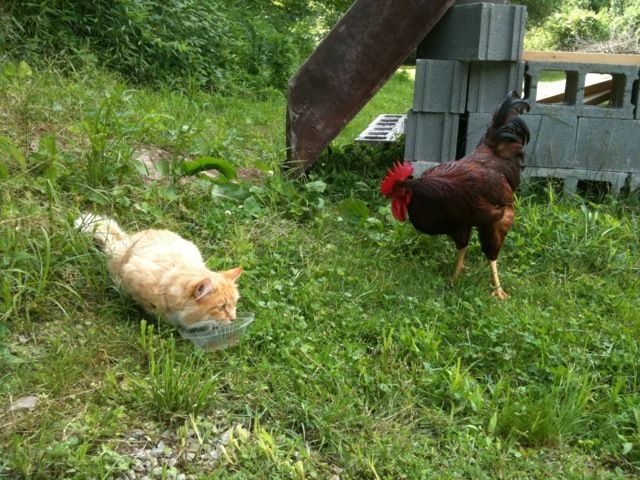 Hopefully Sampson will eventually blend in with rest of freeloaders that inhabit PHF. 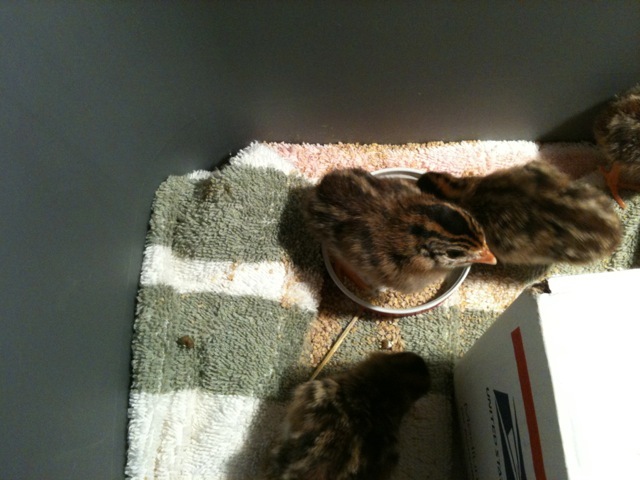 Note: The little guineas are doing great and are already trying to eat us out of house and home. They rested comfortably last night and today we went ahead and put on a heat lamp. The sun was shining all day and kept the solar panels charged up allowing us to keep the lamp running. They have already found their voices and never stop chirping or eating. Surrogate mother Turkey Lady of Two Lynne’s Farm has successfully hatched a brood of seven guineas. The boisterous babies emerged from their shells two days ago and were immediately transferred to a temperature controlled environment. 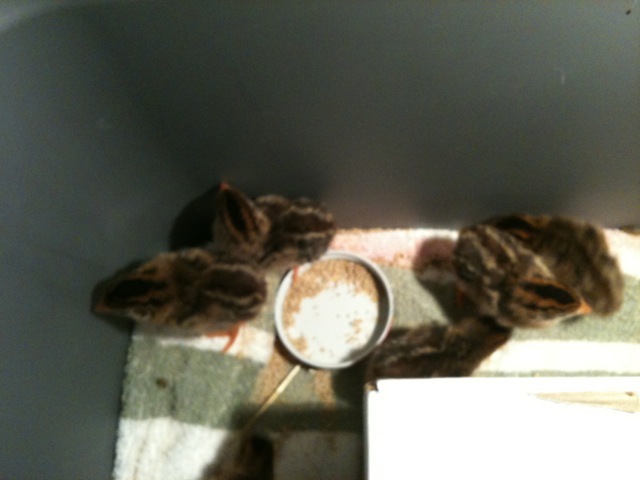 There are six pearl guineas and one pied guinea (a real gift). The biological parents of these seven youngsters were also born and raised at Two Lynne’s Farm until relocating to Pot Hole Farm last year. Mama guinea tried to hatch the little ones herself but unfortunately was attacked by a predator while sitting on the nest. She would be proud of her little ones and thankful that Turkey Lady was able to take over the task. This afternoon the babies were placed into a hay lined box, loaded into the dirt mobile and carefully transported to their parents home at Pot Hole Farm. The babies are now snuggled comfortably together in a nursery box filled with hay and a soft crocheted hat for a crib. Since Pot Hole Farm does not have the ability to use a heat lamp a hot water bottle will be used to keep them warm. Updates will be given as news events happen. Its that time of year again. The hay this year is nice and thick after all the spring rain. Now its time to reap it all. 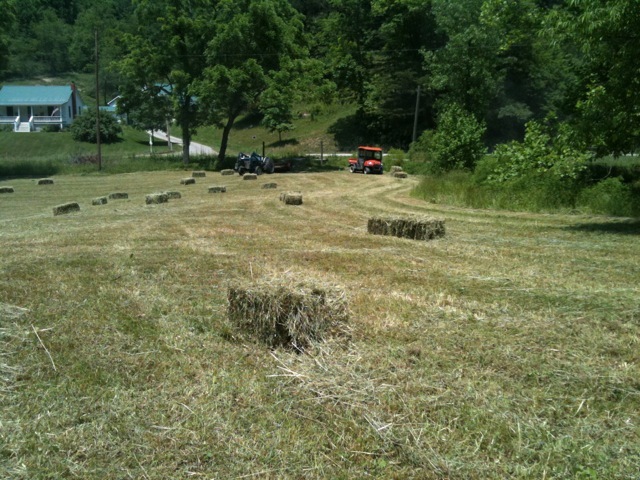 Get those bales to the barn! 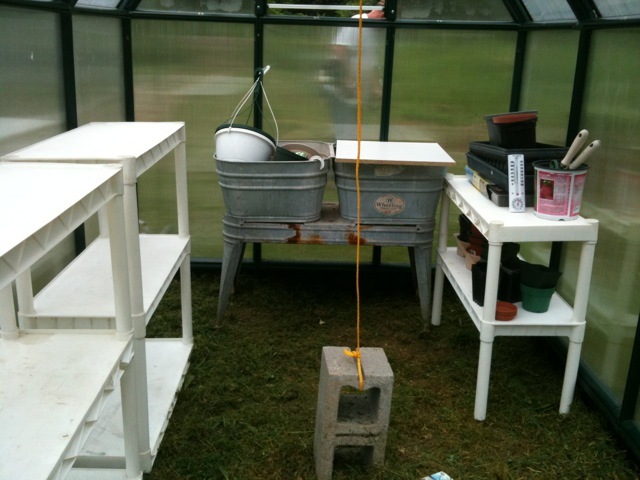 Sonny found some plastic shelving units for the greenhouse when we went to the flea market on Saturday. Its amazing how expensive plastic is these days when you go to buy it in the stores. I remember when plastic shelves were cheap and part of our living room decor, but that was also many many moons ago when our couch was a discarded roadside find. I believe that was just after the era when living in caves and stone furniture was all the rage. We had to use books under one corner of the couch because the leg was missing. When your first married and poor you improvise, but those are the character building times that make good stories for the kids and grandkids. We didn’t always have much but we had enough. Life is good. 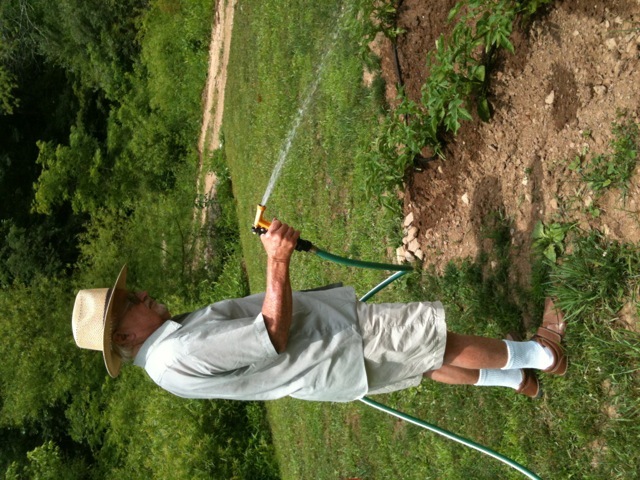 You are currently browsing the Off-Grid in West Virginia blog archives for June, 2011.